and warmer temperatures. Anglers can finally get out on our are inland lakes and Lake Michigan shoreline without having to dress in ice fishing attire! Our areas smallmouth bass fishery in the month of June is something that all bass anglers should experience. The Traverse City Area provides ample inland lake opportunities as well as Lake Michigan fishing options in Grand Traverse Bay. Depending on inland lake water temperatures, it is common to see pre-spawn, spawn and even post spawn smallmouth scenarios in the month of June. If you are looking for pre-spawn jerk bait action, drop shot fishing to big spawners, or just simply casting swim baits to isolated dark spots and drop offs, this is the time to get out. It is no secret that Grand Traverse Bays are offering some exceptional perch fishing in multiple locations, anglers have had a more than productive fall, winter and spring fishery. June is a great time to find the larger schools of post spawn perch feeding in 50-70ft flats mainly comprised of rock and weed coverage, or even in this same depth zone just adjacent to a steep drop off or isolated hump. Perch spreaders tipped with minnows and even soft plastics have been working well for all anglers. 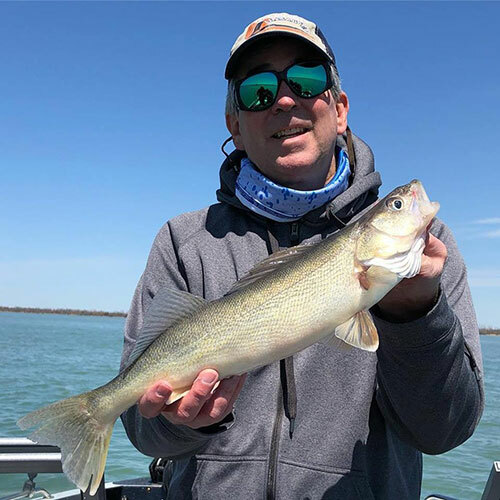 Grand Traverse Bay’s June fishery for cisco, lake trout, and whitefish is a great option for anglers looking to troll, cast and even vertical jig. Most of these fish can be found in the same depth zone depending on water temperature and food supply. The warmest water is typically the best when targeting these species as they are most commonly found in 30-80 ft of water with a surface temperature ranging from 46-55 degrees. Anglers looking to troll will have great success with shorter lead cores, slide divers and down riggers with long leads and smaller spoon presentations. Jigging spoons and blade baits are great options for anglers looking to capture these fish in a casting or vertical jigging scenario. We wish every angler a safe and successful June, we hope to see you on the water! March has snuck right up on us here at Sport Fish Michigan; we are very excited to be putting away the ice fishing gear! This past winter offered some excellent fishing, as well as stellar ice conditions, allowing us to offer a wide variety of species to our ice customers. We had success targeting lake trout, burbot, whitefish, perch, walleye, and northern pike. With the ice conditions quickly diminishing, we have already had the opportunity to hit the open waters of the Grand Traverse Bays. Here is a quick look at what we have been targeting and what we will be perusing over the course of the next few weeks. 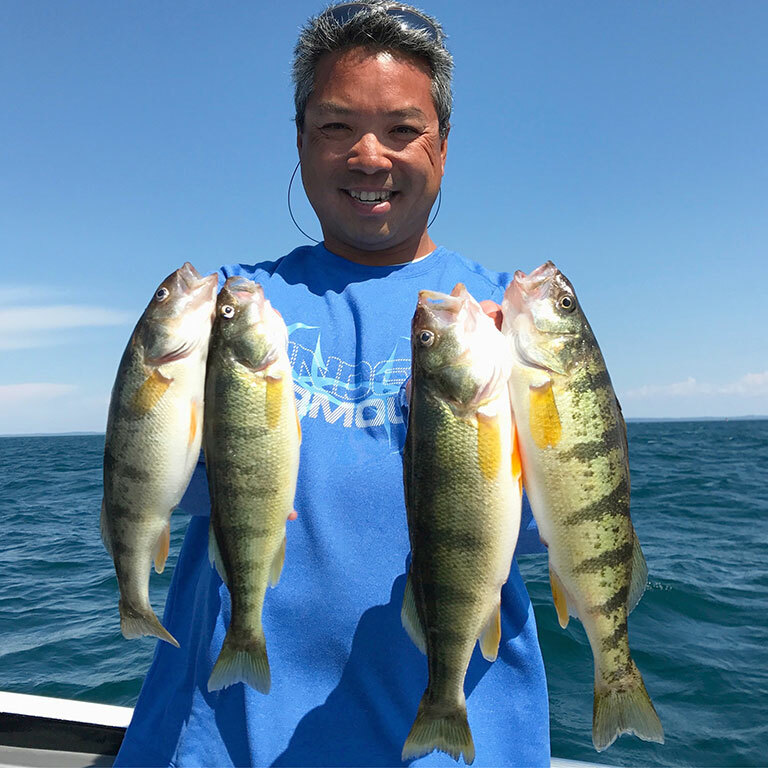 As most of you know, the perch fishing on Lake Michigan has greatly improved in the past two years; this past fall yielded high numbers of perch with a good average size. With the bays not receiving much if any safe ice this winter, the fish have had the chance to feed and flourish with limited pressure. Access to the bays is just starting to improve, shoreline ice is melting, and most of the drift ice has found its way to one shoreline or broken up into miscellaneous pieces. These conditions have made getting out in a boat possible in locations like southern West Bay and southern East Grand Traverse Bay. We are successfully finding large schools of perch with good size in 70-90 ft of water. Most of the active schools are appearing to be 1-2 ft off the bottom in rock and weed-covered areas. Steep drop-offs and inside turns of drop-offs have proven to hold the larger schools. We have had good luck using traditional perch rigs with perch minnows and as well as jigging small jigging Rapalas and 3/4 ounce Jonah Jigs. We have also had good luck finding pre-spawn burbot in 85-110 ft of water just off of 40-50 ft spawning flats. It has been difficult to mark these fish because they are hugging bottom so tightly. Because of this, we have used a fan-casting technique 360 degrees around the boat with 1 oz jigging spoons to locate active fish. Once we have located the school, we then can set up on them vertically. Anglers will also find active lake trout and cisco while fishing this same depth of water. Any 1 oz blade bait or jigging spoon will help in effectively targeting all three of these species. As the water continues to warm anglers will find that the lake trout and cisco will gradually work their way into shallower water in search of warmer temperatures and baitfish. We have also had some excellent steelhead fishing this past week, the warmer days have generated some good runoff and rainfall which has helped bring some fresh fish to our local tributaries. With good numbers of steelhead running this past fall, we have been seeing a large number of holdover fish that are becoming more active on a day to day basis. The most effective form of fishing has consisted of float fishing beads and spawn with conventional gear. Light leaders and smaller presentations have been working best. We have a lot of great fishing ahead of us this spring, and we are looking forward to good numbers of steelhead running our tributaries. This fishing is only just starting to get good; the next two months will only get better for these three species. This is a great time of the year to get out on the Bays and take advantage of some awesome fishing for fish that not only fight hard but taste excellent. Captain Ben Wolfe of Sport Fish Michigan – AnglingBuzzTV fishing report for mid-May in Michigan. Salmon, brown trout, and perch fishing in Michigan – tips and techniques. Inland lakes and Grand Traverse Bay have been producing good catches of perch. Most fish in GTB have been found in 50-70ft. of water. We have seen schools even as deep as 90+ ft., as well. Larger schools are consisting of 7-9-inch fish, but when you can find the smaller concentrations, you can locate the larger fish. Good electronics, such as a Humminbird Helix unit, are crucial in finding these schools. We are so excited to see the perch populations returning to GTB and surrounding ports. Inland lake perch fishing has been good adjacent to drop-offs and weed covered flats in 25-55ft., depending on the bottom make-up. Perch minnows and wigglers have been working well. Finding a softer bottom has been key. GTB has been producing limits of lake trout and cisco. Locating fish has not been difficult at all, finding hungry, active fish has, and can be, a bit of challenge. Fish in deeper water have been more aggressive than the shallower schools. 100-135ft. seems to have large concentrations, but the more active fish have been found feeding in 145-160ft. The trout are gathering in the bottom 10 feet, and the cisco seem to be behaving as they always do in 35-degree water. Cisco can be found feeding aimlessly, with no patterned depth in the water column. A simple mark and drop technique has been working well when jigging and casting for these fish in deeper water. Cisco in the spring often feed half-way up in the water column, and seeing marks “zooming” across our Humminbird Helix screens is the tell-tale regarding the depth in which these scrappy fish are feeding. Trolling the shallow water on the shores of Lake Michigan out of ports like Frankfort, Manistee, Arcadia, and Onekama for brown trout has been great. Using lighter fluorocarbon and longer leads on inline planer boards has worked well. We have found that using more natural colors in clearer water, and brighter colors in dirtier water, has been producing more biters. Most temperatures have been from 36-38 degrees, if you can find any pockets of water with 40-41 degree temps, you should find browns. Fishing on the rivers, we have seen one of the best runs of steelhead our area tributaries have had in quite a few years. We have consistently been hitting fresh fish for the past three months. Just when we think that the run has peaked, and the fish are slowing down, we get another inch of rain and more fish come into the Lake Michigan tributary systems! This past week’s warmer temperatures, however, have increased temps to the low 40’s, and this is really initiating the spawning process. A lot of active, hungry fish have been coming in the faster tail-out water of spawning gravel. Depending on the river, 3-5ft of water has been good. Finding the slower seams in the bottom, inside and outside of faster water covering the spawning gravel has been best. Steelhead seem to have now left the slower, sandier, wintering holes, working their way to higher, faster sections of water. Trout beads, stoneflies, and hare’s ear flies have been great with both fly rod and conventional gear. Indicator fishing and float fishing with beads and spawn has been most productive. We have found that even with the dirtier water, 8mm beads have produced the most fish. Colors like Sun Orange have definitely been the MVP of the spring, with the Clown egg in a close second. While anglers with a valid fishing license are certainly allowed to keep their limit of steelhead, we at Sport Fish Michigan like to practice catch and release whenever we can. Many of these fish can successfully spawn, and are not reliant on stocking programs. For this reason, releasing spawning fish is crucial in helping to maintain our steelhead fisheries for years to come. Good luck out there, we hope to see you on the water!